During his appearance at TechCrunch Disrupt NY today, Google’s “Captain of Moonshots” Astro Teller briefly talked about Project Loon, the Google X project that uses stratospheric balloons to bring Internet to underserved areas. 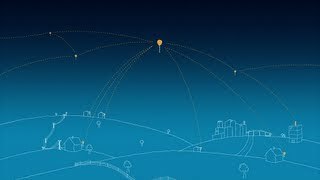 One thing that has long been unclear about Project Loon is how it would use licensed or unlicensed spectrum and how Google would acquire it. Turns out that before announcing the project last year, the team was actually hoping to buy harmonized spectrum itself, but it’s now planning to work with existing telcos and to use their spectrum instead. “We actually thought this was just going to be absolutely critical to the project,” Teller said. “And we wanted to get it done before we launched.” The team had actually worked for half a year to get this spectrum deal done and worked with a number of large companies to make it work. Larry Page, however, told the team “You’re going to hit a double — that’s not really interesting. You are going to be really frustrated. You’ll be really angry for a week, but then you’ll get creative and you’ll come up with a home run.” And indeed, for a week afterwards the team was angry and came up with something way better than just buying a small piece of harmonized spectrum. Instead, Loon now uses the spectrum that already exists in a given country. So when a Loon balloon is over a given country, the telcos will be able to lease the balloons while they pass over. As a result, Google doesn’t have to license the spectrum because the telcos already own it. That way, the telcos won’t feel as if Google is trying to steal their users. Also, because these large corporations own far bigger wedges of spectrum than Google could have licensed, the project is able to offer users way more bandwidth than they otherwise would have. Teller’s comments also put into perspective some of the recent reports that Google is testing LTE for Loon in Nevada. Until now, it was somewhat unclear how Google would use this spectrum, given that it would need a license to do this. If Google is working with telcos on this project, though, this explains why it would be testing LTE in Nevada now.